Have you been able to take stock of what you have achieved over the last few weeks? It’s been a slightly manic time, but I have had some time to celebrate with family, friends and those who have supported me other the years. I had already planned to take a holiday with the family before I won in Germany, and had a few other commitments away from tournament golf, but it’s also a very important period in the season, and I need to get back out there and make the most of the remaining opportunities that I’ve got on the European Tour. I’m currently 61st in the Race to Dubai, and need to get into the top 60 to qualify for the final three events, so that’s my next target over the coming weeks. You came into the Vaudreil Challenge on the back of some indifferent form. What changed for you that week, and did you feel like a performance was coming? Although my results hadn’t been that great in the run up to France, I felt like I was swinging it well, and was confident that if everything fell into place in the same week, then I could put a score together. Two weeks before, I was invited by David Howell to take part in a pro-am at Queenwood Golf Club. David’s a good friend of mine and he’s a member there, and every year the membership invites some pros to come along. Given the exclusive nature of Queenwood, and the type of members it has, the tournament drew an impressive field, including Rory McIlroy, Justin Rose, Tommy Fleetwood, Adam Scott, Jon Rahm and a few other top players – it was crazy, it was like a mini-WGC event. I managed to shoot 64 to win the tournament, and that gave me a real psychological boost. It may not have been a proper tour event, but we were playing for a decent prize fund, and to shoot that score alongside that group of players was a real shot in the arm for me. I owe David a few beers! So I arrived in France feeling pretty good about things. I had played Le Vaudreil course a few times before, and knew that it suited my game. I just felt comfortable from the start. I shot 64 and 66 to be five shots clear of the field after two rounds, and then shot two 68s over the weekend to win by two. It was great get the win, but I was also really pleased with the way I managed to lead for all four days and hold up under the pressure. Finishing it off down the stretch is always good for your confidence, so I took that form with me to Germany. Needing to birdie the last hole to win the European Open, you opted to lay up short of the green and hope to get up and down. What discussions did you have with your caddy before you made that decision? My second shot was purely dictated by the lie I had in the rough. If I had found the fairway, I would have gone for the green all day long, but my ball was sitting down a bit in the semi-rough, and there really was no chance of reaching the green with any kind of control from that lie. With water in front, the only sensible play was to chip out and wedge in. Once we’d seen the lie, there was no discussion, and I was pretty confident that I could hit it reasonably close from there, and give myself a solid chance at making birdie. In the end, I came up a little short, leaving me something like 18 feet to the pin. As I walked on to the green, I felt incredibly calm. It was an uphill right-to-left putt, which I had played and practiced before, so I had a pretty good read on it. It was incredible when it dropped. It was a very emotional moment. Did ever you wonder whether you’d ever manage to win at the top level? I always knew that I had the game to make it on tour, but winning isn’t easy at any level out here. There are 150-odd players trying to win every week and 149 of them end up losing, so there are a lot of losers on the tours, in the nicest possible way. 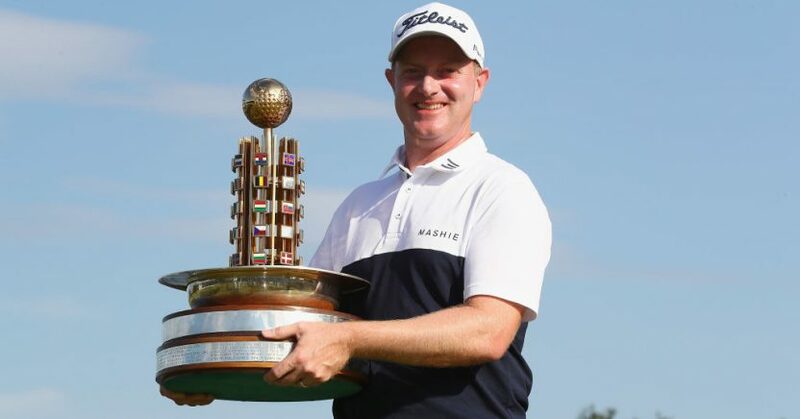 Of course, I would have liked to have not waited 280-plus tournaments to get over the line on the European Tour, but that makes it all the more special. Of course, there have been some difficult times over the years, but I never felt like giving up at any point. I’m lucky to have a very loyal group of supporters behind me, a great management team in Jenahura, while my wife and my parents have believed in me every step of the way. During a particularly difficult patch a few years ago, I set up a shareholder deal, so that I would split a percentage of whatever prize money I earned with them. That worked out well, and I can’t thank those guys have stayed with me enough. Who is in Team McEvoy? I wouldn’t call it a team as such, but my coach is Paul Holland, who I’ve been with for three years now. He’s based at Abridge Golf Club in North London. The work I’ve done with him over the last couple of winters has really brought my game back. I’ve gone back to a more natural way of playing, kind of freewheeling a bit, and just trying to enjoy my golf more and that’s really helped – playing with a smile on my face, rather than getting down on myself. We’ve also done a lot of work on my putting, which was previously one of the weaker parts of my game. That really paid off in both my wins, where I feel like my putting really held up under the pressure. Where do you practice when you’re at home? I do most of my practice either at my home club, Thorpe Hall in Southend, or at Abridge. I’ve been a member at Thorpe Hall since I was a junior, so it’s kind of a second home for me. Both clubs have indoor studios, so I can work on my game over the winter if need be. I used to go abroad to practice during the off-season in my earlier days, but with a young family on the scene, now I generally stay at home. The club and the members at Thorpe Hall have been really supportive over the years, and I can’t thank them enough. They very kindly hosted a party for me over the August bank holiday, which was great. I took along the European Open trophy and we had a great day. How pleased will you be not having to go through European Tour qualifying for a 13th time? Yeah, besides the prize money, securing my tour card through to 2020, and not having to even think about Q School, is obviously one of the main benefits of winning. I was planning on playing a full Challenge Tour schedule this year, and trying to earn my European Tour card that way, but after winning in Germany I can now sit down and plan my schedule for next year and beyond, and know that I’ll be playing for decent prize money and really have a chance to take my career forward. I’ve done pretty well at qualifying school over the years, but it’s not how you want to start the beginning of every season, believe me! Have you bought anything with the prize money yet? Not yet, although there are one or two things that I’ve not been able to afford in the past that I’ve got my eye on!